The next step was to try making my own silk caps. To get started I had to make a choice. I could either use the cocoons a la natural and remove the little dead wormies myself, or I could use the cut cocoons. I decided to use the cut cocoons. First they had to be degummed. 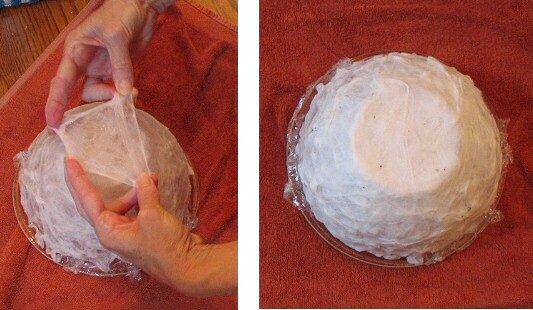 The recipe from Jane, the workshop’s tutor, called for 50% soap flakes and 25% washing soda per weight of silk. I couldn’t find soap flakes, so I substituted Ivory dishwashing liquid, as described in A Silk Worker's Notebook by Cheryl Kolander. Looks yummy, doesn’t it? 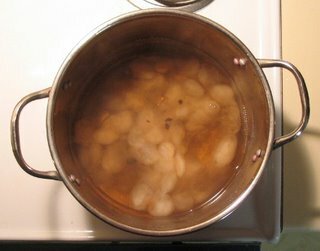 I let them simmer for over an hour and then rinsed them in cool water. It is an amazing process, actually. Some of the cocoons stretched into beautiful ethereal layers, pulling nicely over the surface of the bowl. Some wouldn’t cooperate at all! I had about a dozen cocoons which ended up torn to shreds. Eventually I started to get the hang of it. I wasn’t able to get all of the cocoons stretched completely over the bowl, but most of them found their places as some semblance of a layer. I used about 60 cocoons in this cap. After it dried I gently took it off the bowl. 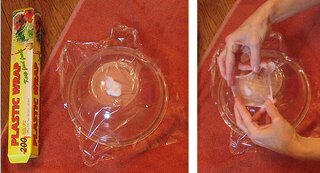 The plastic wrap made it easy to remove. All that’s left now is to spin it! If you find all this of interest, then you might want to visit www.wormspit.com. It will tell you everything you ever wanted to know about silk moths, plus some things to do with silk and silk moth cocoons. I just didn't have time for a workshop this month, but what your producing looks wonderful. Howdy! I noticed I was getting hits from your blog page, and popped over to see what was going on. Great stuff you've got there! The traditional form for making silk caps is a bamboo hoop. I don't have one of these (yet) but I'm aiming for that direction. I had very mixed luck using the bottom of a vase. I think the curved hoop form would be easier. I'm wondering if a wire form or a bent tube might work, in place of bamboo. If you're working with quite a lot of silk, the weight of goods method is appropriate. If you're working with a fairly small amount, you may find a standard strength solution better suited; otherwise, the amount of water needed to float everything nicely can dilute your solution's pH. I use 1/4 cup each of Orvus paste and washing soda, per gallon of hot water. This is based on a recipe given to me by a silkmoth researcher, Dr. Richard Peigler. For cocoons that don't want to stretch: if you hold them with your fingertips, below the level of the soapy water, and gently "pat-a-cake" the cocoon, turning it gently as if you were flattening out a delicate biscuit, it helps it bloom out. It should hang in the water like an egg yolk - definitely there, but not solid anywhere. Then lift underneath it, upward and outward with the fingertips, as if you're lifting and stretching a tiny pizza dough. Dunno if that helps any, but that's the best I can explain the motion I use. The soapiness of the water helps it stretch. Did you make sure to rinse out all the degumming juice, and re-acidify the silk? 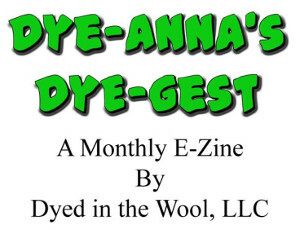 The alkaline in the degumming solution can rot the silk very quickly. Michael, thanks so much for your comments and excellent advice. No! 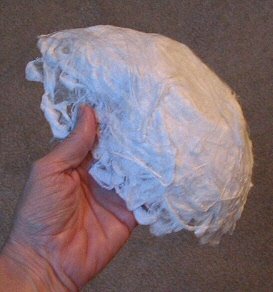 I didn't re-acidify my degummed silk, though I did rinse it thoroughly. I'm very glad to know I need to do that. I'm so impressed with your blog! Where did you get the cocoons? 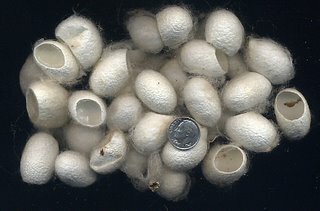 Did you raise the silk worms from eggs? Thank you for your kind comments! The cocoons came as part of a silk goody pack which I ordered through the Online Guild for a silk spinning workshop. I have to admit that I never considered raising silk worms since the process seemed pretty intimidating. But after actually working with the cocoons and looking at Michael's photos and information on www.wormspit.com, I can now say that I've put it on my list of things to do someday.